Just want to jump down below to my VMworld 2018 US session list? Click here. I just got approval and booked my trip to VMworld yesterday, awesome! Like last year's retrospective, here's a summary look back at the variety of roles and activities I've done at VMworld over the years, ending with my plans for this year. VMware's software defined storage, get your VVol [Virtual Volume] overview here! When in a consulting role at IBM, I found ways to get to VMworld 3 times. I was one of those VMware enthusiast employees who kept up with VMware vSphere since the VMware GSX days in the early 2000s. I even had the chance to perform dozens of hands-on consulting jobs 2006 to 2009, but honestly, when I attended VMworld, I barely knew anybody. It was actually a somewhat lonely experience, with my focus only on education and discounted certification testing. Years later, I sure realized that the more folks I met and befriended, the more fun attending became, and the more value I got from the experience. Far more. Later on, I got to help with the VVols announcement by doing live demos in the IBM area, right next to HP's Eric Siebert, all of us at the top of the escalators at Moscone West. That was to be the very last VMware Partner Exchange. Yes, this VMworld was also the big vSphere 6.0 announcement, I remember it well, Feb 02 2015. I was responsible for training my storage hardware technical peers in all-things-vSphery upon my return, which was fun to do, and quite a challenge. VMworld 2015 in pricey San Francisco was covered by my employer, since I had (thankfully) been asked to do a live demo of VVols in a break-out session. Phew! What an honor, and a lot of fun and learning the rest of the week. Yes, I was able to present, attend sessions, and had blogger badge as well. 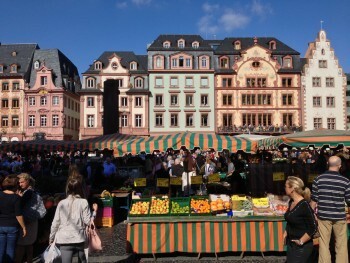 Busy, educational, and fun! As a continually busy content creator for my TinkerTry.com, I was again blessed with a blogger pass from Corey Romero at VMware, which wasn't exactly a secret. This pass made all the difference, relieving much of the financial strain of getting to VMworld 2016 in Las Vegas by covering the cost of the all-access pass. That's right, I wouldn't have been able to attend without him, thank you again @vCommunityGuy! In 2017, I wasn't at VMworld as a blogger that gets to hang with Pat Gelsinger, but I'll certainly be blogging anyway. I'm mostly at VMworld this time to work, but as a VMware Systems Engineer for vSAN! It's great opportunity to meet with my customers too. My job is part of VMware SABU, the Storage and Availability Unit, and I know full well that a great majority of VMware employees don't get to go at all. In Vegas, it wasn't quite as hard to stay safe and save money as it was in San Francisco, but it's still pretty pricey, even for VMware sending its employees. I'm one of those people that doesn't mind working at events to earn my keep, having done so many times in the past. And I actually enjoy talking to people, people I know, and new people. I'm always the AV geek fixing projectors at user groups anyway, whether I'm presenting or attending. Seeing how it all goes down behind the scenes has always interested me. Wow did I have fun hanging out in the #VMTN area, helping bring in some foot traffic. What a joy, and what an honor! Of course, there was some live demo, but mostly a whole lot of tech talking with so many folks I had never met in person before. Getting to nerd-out in person with a variety of people from all over the world is an awesome thing to have the opportunity to do, with special thanks to @vCommunityGuy and @elsajmayer! I managed to cram 9 of these clips in during 2 short breaks from booth duty, as seen here, in 4K! Another busy but fun five days that sure flew by fast! There are so many employees and IT heroes and vendor booths I hope to try to visit, and inevitably never enough time. That's OK, more reasons to look forward to hopefully attending in 2018, when I plan to submit presentation topics for a general session, and some topic ideas to the great folks who run the VMTN/vBrownBag community area. The call for papers process is a bit emotionally grueling, and I admit I've also experienced my share of many rejections over the years, this year included. I wasn't kind of bummed the proposed home lab related panel didn't work out. Never a great feeling, those feelings of dejection. Congratulations! We are happy to announce that your session proposal(s) has/have been accepted for VMworld US, taking place at Mandalay Bay Hotel & Convention Center in Las Vegas, NV from August 26 – 30, 2018. To confirm your place in the program please accept your invitation, by logging into the Speaker Resource Center (SRC), no later than Friday, June 15, 2018. I can't share the details or session title quite yet, since my co-presenter doesn't quite have his final approvals squared away just yet. I should be able to share more details soon. This is a first for me, and quite an honor. So glad the lead presenter encouraged me to join him in this submission, and I probably wouldn't be going to VMworld without him! 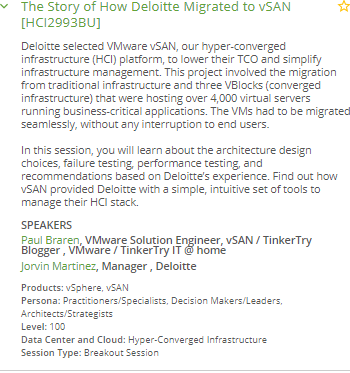 This will be my first time speaking at VMworld since 2015, which was really more of an IBM-sponsored break-out demo of VVols, so this time extra special for me personally, featuring a vSAN customer success story. Deloitte selected VMware vSAN, our hyper-converged infrastructure (HCI) platform, to lower their TCO and simplify infrastructure management. This project involved the migration from traditional infrastructure and three VBlocks (converged infrastructure) that were hosting over 4,000 virtual servers running business-critical applications. The VMs had to be migrated seamlessly, without any interruption to end users. In this session, you will learn about the architecture design choices, failure testing, performance testing, and recommendations based on Deloitte’s experience. Find out how vSAN provided Deloitte with a simple, intuitive set of tools to manage their HCI stack. Looks likely I'll also have some hours at one of the HCI (Hyper Converged Infrastructure) related VMware booths, details on that still being squared away. Always a great chance to talk to VMware customers about a variety of interests, which I quite enjoy. Seriously, I enjoy hearing your stories, but please don't hesitate to stop by, even if you only have time to just to say hi! I will have my home lab gear with me this time, special thanks to Corey Romero for this opportunity! Please don't be shy and introduce yourself to me, wherever you bump into me! I'm always happy to give out stickers, and/or do live demos of my home lab cluster. Who knows, I might even show you a live vMotion of an OS/2 VM, running on Optane storage. You think I'm kidding? 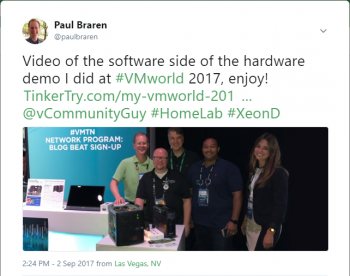 Hopefully some TinkerTry readers who are also planning to attend VMworld 2018 can make sure our paths cross at some point Las Vegas, with @paulbraren being the best way to reach me while there, or contact me by email in advance. Paul will have U.2, M.2, and PCIe NVMe SSDs on hand including Intel Optane/3D XPoint. Visit to nerd out about the latest tech that fuels his portable but very powerful home datacenter, running the new vSphere 6.7 downloaded from VMUG Advantage EVALExperience, of course, with some dabbling in vSAN. Intel Xeon D systems from both Supermicro and Gigabyte will be featured this year, and it’s a great chance to meet the author behind all that home lab enthusiast and consumer electronics content at TinkerTry IT @ home – Efficient virtualization, storage, backup and more. I submitted a proposal for a 27 minute session about NVMe SSD storage technology, but I won't know if it's accepted until some time after submissions close on June 30th. Fingers crossed! Feeling a bit confused about the differences between these form factors, and how you connect, configure, and update them? Stop by to see some samples of each, from Micron, Samsung, and Intel. Curious about hot swap U.2 drives? You'll also see an Intel Optane SSD featuring all-new 3D XPoint non-volatile memory, great for workloads that require extremely low latency. 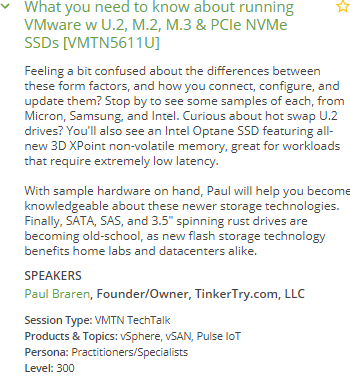 With sample hardware on hand, Paul will help you become knowledgeable about these newer storage technologies. Finally, SATA, SAS, and 3.5" spinning rust drives are becoming old-school, as new flash storage technology benefits home labs and datacenters alike. I now have some videos to share with those who couldn't make it to my sessions. Like last year, I found it a bit challenging to actually do a live demo in a shared space with many guests nearby for various activities, so instead I focused on showing the physical gear to those who stopped by, along with discussing a variety of tech topics. For folks looking for a software demo of what you can do with a home lab like mine, using the equipment that I had brought with me to VMworld, here you go! All VMworld related articles at TinkerTry.